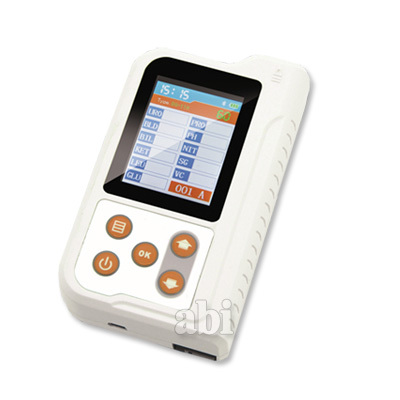 BC401 Urine Analyzer is a high-precision, intellectual instrument which is researched and developed basing on modern optics, electronics, computer science and other advanced technologies for clinical inspection of urine. GLU, BIL, SG, KET, BLD, PRO, URO, NIT, LEU, VC, PH, MAL, CR and UCA in urine can be tested by using it with special test strips. And it is applicable for use in hospital, community health service, clinic, epidemic station and family, etc. - High-luminance and white LED, features in long life and good stability. - Display abundant contents by the 2.4'' LCD, optional languages: Chinese and English. - Optional units: international unit, conventional unit and symbol system. - Monitoring the whole test process, auto-character and audible prompt. - Be compatible with 8, 10, 11, 12, 14-parameter test strip (optional based on the type of test strip). - Test items: GLU, BIL, SG, KET, BLD, PRO, URO, NIT, LEU, VC, PH, MAL, CR, UCA (optional based on the type of test strip). - Data storage: Storage of 500 sample data, which can be queried by test date, sample No. and user name. - Interface: Standard Micro USB interface, Bluetooth interface (Optional).